Pressing On is artfully composed and includes some great interviews with ‘old-timers’ and the new generation of printers that is benefiting from their knowledge and putting it to work. It is reminiscent of the 2009 film Typeface, which focused its attention on the Hamilton Wood Type & Printing Museum (whose director, Jim Moran, is also interviewed in Pressing On). Pressing On is broader in scope -- spotlighting, for example, the Platen Press Museum in Zion, Illinois, and Nashville’s Hatch Show Print -- yet shares the sensibilities and sympathies of Typeface, and, well, letterpress lovers everywhere. Pressing On: The Letterpress Film - Trailer #2 - Exclusive VOD from LetterpressFilm on Vimeo. Initially released to theaters last year, Pressing On: The Letterpress Film becomes available on DVD & VOD today. Pressing On is a feature-length documentary that begins with a simple question: "Why hasn't letterpress died?" 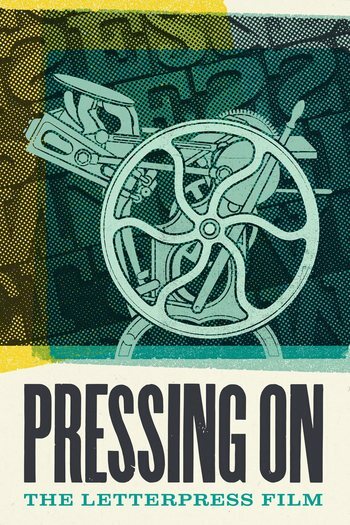 Pressing On is artfully composed and includes some great interviews with 'old-timers' and the new generation of printers that is benefiting from their knowledge and putting it to work. It is reminiscent of the 2009 film Typeface, which focused its attention on the Hamilton Wood Type & Printing Museum (whose director, Jim Moran, is also interviewed in Pressing On). Pressing On is broader in scope -- spotlighting, for example, the Platen Press Museum in Zion, Illinois, and Nashville's Hatch Show Print -- yet shares the sensibilities and sympathies of Typeface, and, well, letterpress lovers everywhere.